I hit the 20-week mark with the SharkBean this week. (That's halfway, for everyone who has never been pregnant.) I am *thrilled*. She looks less carcharias, and more homo sapien. I can feel her practicing krav maga. This is really happening. It's pretty exciting. I'm definitely, exclusively in maternity clothes. Mom informed me that I have "popped", though I don't look pregnant enough to have the young men at the grocery store offer extra help yet. That's totally okay, maternity clothes fit either like (a) pajamas or (b) being naked. Elastic-waisted pants and maxi-dresses, where have you BEEN all of my life?! My dad asked how I was feeling, and I told him that I felt big, meaning, it feels crowded from my ribs down to my hips. I'm putting on my shoes by sitting and putting my foot up next to me (thanks, yoga! ), as opposed to just bending over, or squatting and bending over like I normally used to do. My dad thought I was concerned about weight gain, and hurriedly told me - ME, the kid who hasn't ever had body image issues - that it's okay to be big when you're pregnant, it's a good thing, etc. Love his heart- how many fathers try to tackle body image issues head-on, instead of glossing over them and hoping everything turns out okay? My dad. He took a very "shut it down" approach- quick, and clear. It wasn't necessary, but as a Future Parent and Aspiring Grown-Up, I appreciated it. I told him I didn't care about the weight gain, but that it's getting hard to do simple things like put on my shoes. Or sit comfortably on the couch without the assistance of a mountain of strategically placed pillows. I actually heard his sigh of relief at my *very normal* complaints. As a woman, I'm totally okay with getting bigger. Circle of life, phases of the moon and all that. Also, the spectacular boobage. I'm totally sold. As a knitter, things are more complicated. I have two sweaters worth of handspun waiting to be cast on. For two fitted sweaters. I have a few UFO bins full of half-finished projects. Also fitted. My tastes run to tailored clothing, and I'm caught in the I-don't-know-how-my-weight-will-settle-out place. Weigh that against my mother's sage advice, "Knit for the body you have, not the body that you *want* to have." The body I have is changing, week by week. What is a knitter to do? I came to the solution, finally. Knit something small. Knit something that doesn't depend on *your* size. I can go on a binge finishing old lace projects. A lace wrap will always fit! That gold Icarus I started five years ago? Will look AMAZING on me, regardless of my size. 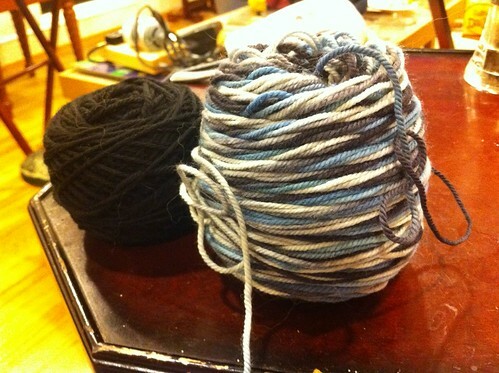 I think it's funny how inversely proportional this whole thing is; as I get bigger, my knitting gets smaller. But, first things first. My oldest friend in the world, Joey, is going to be a dad ANY MINUTE. So last night, some yarn was wound, a tiny sweater was selected, and I am quickly reminded of how incredibly fun (and fast!) it is to knit for small people. Congratulations and best wishes to Joey, and kudos to your dad and to you too. Someone once asked my then-95-year-old grandmother when she stopped worrying about her kids. "Eighty," she answered. Oh, so when you turned 80 you figured they were okay? Ahh... Yassie, your mom was actually staying with me in Boston, when she "popped", pregnant with you! I remember her sewing a beautiful maternity dress for herself, white with a sailor collar, with navy trim, on my antique sewing machine. I was so impressed with her talents. Also she seemed remarkably calm about it all, and when I think of the crazy hours we all kept, the irregular meals, the partying! Oh my God. By-the-way, this is Mary Ellen. Those lace shawls are perfect to throw around you as you are nursing the baby when you're out and about, too! I love my black maternity pants. I think all pants should have elastic waists now. I tried to put on one of my cute pre-prenancy cardigans this morning and even open face it didn't look quite right. Congrats on your SharkBean, Jasmin!!! The worrying never stops and changes. I won't tell you all the worrying I've done after having my daughter. :) It's crazy what our brains can come up with! I can recommend cardigans that have a little ease beyond your present bust measurement(1-2"). You can likely wear them open or with just one or two buttons buttoned all through pregnancy, they will definitely fit post-baby, and they will have a comfy not-too-oversized fit if you go back down a size or so after SharkBean is weaned. If you knit them in a store-bought basic yarn you won't be heartbroken if eventually they no longer fit perfectly and get handed on to a friend. I have a 6-year-old store-bought cardigan I wore through pregnancy that still works great as an around-the-house garment. Kudos to your dad. I agree with your mom. It took me a long time to learn that lesson. Yes its true you will never, ever stop worrying about your little one. Also they will always be your little one no matter how old they get. Now with it being your first little one and all the chances of you getting back to pre-baby weight are pretty good. Knit yourself a scarf, hat, ANYTHING that you can model. I, (as I'm sure thousands of others) would love, love love to see you carrying your little sharkbean! The boobage is not fantastic IMHO (your mileage may very)...I was ample to start with and am now past pr0n star. I've probably got another 6mos at most of breastfeeding left (the Benton is almost 6 mos) and I pray that I go down to my normal size cause this is ridiculous. I had planned on doing a sweater for myself and will wait. I've made lots of shawls and cowls though, and hats and mitts. Though I had to search for the perfect cute sweater while preggers, I got a nice 3 buttons swingy one for the winter here in AZ. And no, you don't stop worrying...its rather reassuring to hear that from everyone else.